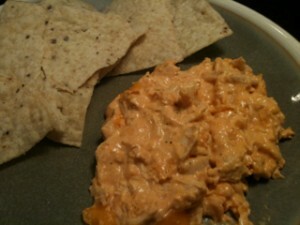 This version of buffalo dip is creamy and has just enough heat. It’s a huge hit at parties when served with tortilla chips and celery. It also makes a mighty fine dinner. Or so I’ve heard. Preheat oven to 350 degrees. Combine shredded chicken and wing sauce in saucepan on low until all chicken is covered in sauce. Add cream cheese, ranch dressing and 3/4 C. cheddar cheese. Stir together until combined. Pour in small, greased casserole dish and sprinkle with 1/2 C. cheddar cheese. Bake at 350 degrees for 25 minutes. Remove from oven and let sit five minutes before serving.